The Texas Land Trust Council maintains a strong focus on education and training, to ensure that Texas land trusts are keeping pace with land conservation efforts nationally. Our premiere educational event, the Texas Land Conservation Conference, offers three days of training and workshops on topics geared for all types of public and private land and water conservation-related professionals and interested landowners. With several hundred attendees each year, this event is critical to the continued strength and integrity of the land conservation movement in Texas. The Texas Land Conservation Conference is the preeminent statewide meeting for anyone working in the field of land and water conservation, including private landowners interested in conserving their land, government staff, NGOs, agency partners, and any person interested in these important issues. The annual three-day event brings in experts from around the state and nation to provide exceptional networking and education opportunities. The conference features topics related to conservation easements, land use change, water policy, private land stewardship, conservation funding opportunities, conservation and mitigation banking, and advocacy issues. 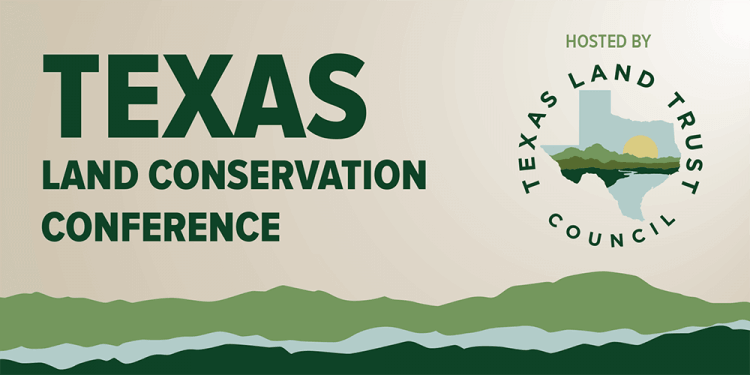 The conference is essential to strengthening the depth of knowledge of the conservation community and inspiring excellence among Texas land trusts. Click here for information on our annual event.